Some of you may remember my less-than-enthusiastic response to one item in a gift package sent from Bamma to my boys. 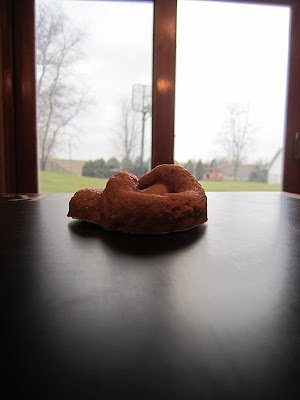 It's not that Cael and Graham wouldn't enjoy artificial poop- in fact, I always knew that if they discovered it they would giggle with delight and likely squat on the floor to reenact its creation. But I also knew that once that can of worms was opened, no amount of chicanery or brute force would close it up. So I stashed that poop in a cabinet and closed the door. It is December now, and cold. So a few days ago when I was chilled to the bone and wearing two pairs of socks, I decided to use the frozen turkey (and chicken) leftovers to make cream of "turken" and wild rice soup. I started in on it at naptime, first making a roux and slowly letting it cook to develop the flavor before adding the other ingredients. But only 20 minutes into his afternoon nap, Cael woke up and wanted to help. Cael's idea of help is less "helpful" and more "hinderance", but I do like to include him when possible, so I asked him to get a tupperware container to hold the cooked veggies until I was ready to add them to the sauce. I heard the giggle but couldn't find the boy. Not only was he missing in action, but I hadn't yet gotten the bowl I'd requested and had to put the carrots on the counter while I dug out a dish. "Cael, don't you want to help me?" "Nope!" I heard from behind the couch. "Okay, just stay quiet so that you don't wake up Graham." It didn't really register in my head. I was busy cooking and the minute portion of my brain still capable of processing information concluded that he was not choking, vomiting or impaled by train tracks. Beyond that, it executed a virtual "smile and nod" response to my son's words despite the fact that I hadn't given him any food to eat. Wait, what? As I was coming out of my fog, I walked around the couch to see what Cael was consuming and gasped in horror. There I found my son, on the floor, gnawing on plastic imitation poop. "I'm eating this pretend pretzel." "You're what?" That just didn't make sense. "See, Mommy? It's a fake pretzel." With that, Cael held up the now wet knot of artificial excrement and I could see, for a moment, what he meant. If four years of raising Cael has taught me anything, it is NOT to mention poop if at all possible. If he thinks something looks like poop or says poop or is in any way related to poop, he will cling to it like a fly to, well, poop. So I did my best to ignore this most disgusting activity my son had invented and went about my cooking, pausing only occasionally to mention to Cael that he shouldn't really put the "pretzel" in his mouth but rather pretend to cut it up on the table. My tactic seemed to work. After 30 minutes, Cael abandoned the brown knot and headed downstairs to bang trains together, and when my soup was assembled I went to the basement to check on him. "Ouch!" My still-healing pinky toe landed just wrong on the plastic poop which had been placed precariously on the edge of the step. And the next day, there it was in the silverware drawer. And later, crammed inside a sock. It seemed like the mystery pretzel possessed superpowers and traveled within my house by the mere power of suggestion. As I picked it up from its perch on top of the doorknob, I couldn't help but to whine to myself. "Ugh.. How am I going to get rid of this poop...?" "WHAT? It's poop? Graham! Come quick-- the pretzel is poop!" OMG that Poop on the door knob is just killing me! HAHAAHA! Pavi- I probably found that thing 15 different times. Those were just the times I had my camera handy! Amanda- Glad you liked it! There's nothing like stumbling over poop around every corner!